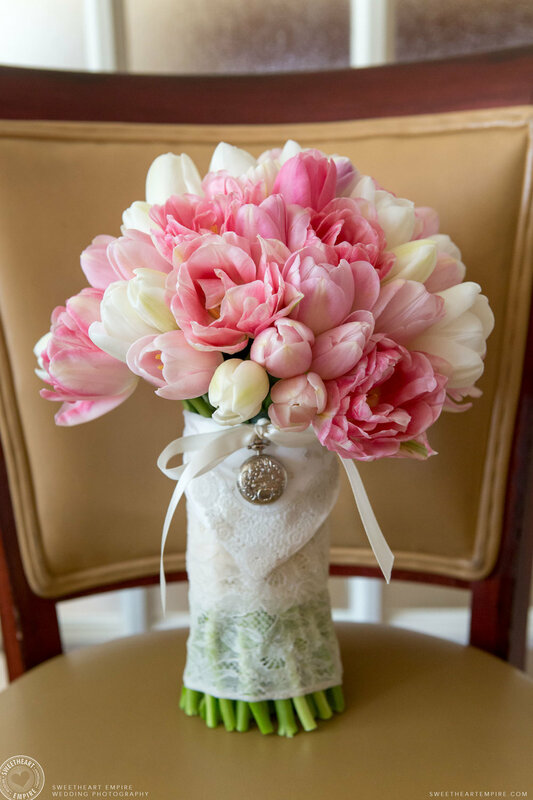 Jeff & Kerri had a super romantic, book-themed wedding at the Toronto Reference Library. 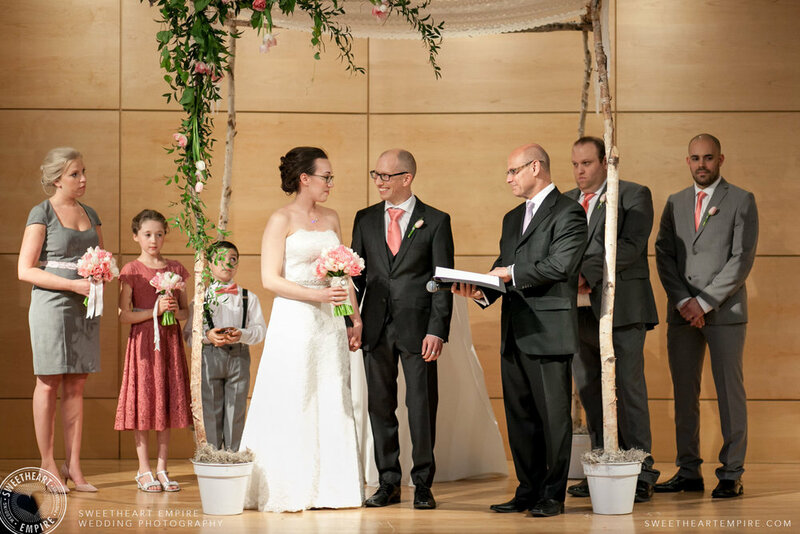 Their Jewish ceremony was held right in the stunning main foyer, with dinner and dancing to follow in the Bram and Bluma Appel Salon. In between we took the opportunity to roam among the stacks, and I'd be lying if I didn't tell you these two stole a few newly-wedded kisses too. 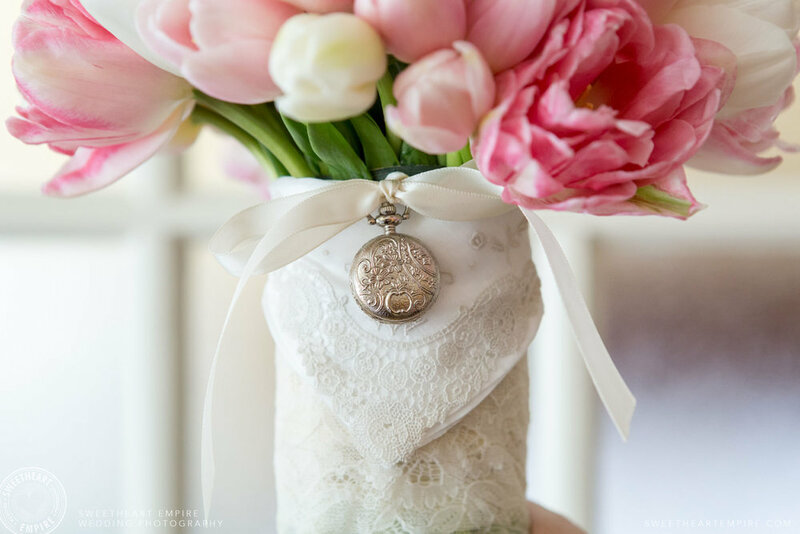 Kerri had a beautiful tulip bouquet tied with her grandmother's locket. Once dressed, she did a first look with her dad who, naturally, got a bit emotional on his daughter's wedding day. Then Jeff came in for another bridal reveal, and after a lot of happy exclamations from each of them, the bride and groom exchanged gifts. I loved this private moment of Jeff putting on Kerri's necklace and sneaking a little kiss on her shoulder while "no one" was looking. If you've seen Kerri & Jeff's Toronto Island engagement photos, you might have guessed these two have an ongoing love affair with the City of Toronto! Their wedding guests assembled in the incredible atrium of the Toronto Reference Library. As the largest public reference library in Canada, this space is outstanding... and the perfect location for a pair of book-lovers to get married. Jeff & Kerri had a wedding ceremony with Jewish elements, standing under a lace Chuppah and each smashing a glass for the Mazeltov moment at the end. To start with, however, Kerri and her father descended to the foyer via the glass elevator, for everyone to see. They kept their backs turned, and I could sense the excitement and nerves as they sailed down from above, and made their way towards the alter. Jeff was smiling ear-to-ear (pretty much all day, but even more at this moment). As Kerri rounded the top of the aisle her face just beamed with happiness at the prospect of marrying Jeff, like, right now! As if that wasn't enough, their ring bearer was visibly choked up. How adorable is this little guy?! One of my favourite moments in this wonderful day, was a reading during the ceremony – an adaptation of the poem, Date A Girl Who Reads by Rosemarie Urquico. Being a bit of a book nerd myself (understatement alert! ), this was basically the most romantic thing I've ever heard. Jeff & Kerri replaced the word "date" with the word "marry"... Tears flowed. I'm posting the full text of the poem below, although not all of it was said at the wedding. Replace the word "date" with "marry" and have a good happy-cry on me. Date a girl who reads. Date a girl who spends her money on books instead of clothes, who has problems with closet space because she has too many books. Date a girl who has a list of books she wants to read, who has had a library card since she was twelve. Find a girl who reads. You’ll know that she does because she will always have an unread book in her bag. She’s the one lovingly looking over the shelves in the bookstore, the one who quietly cries out when she finds the book she wants. You see the weird chick sniffing the pages of an old book in a second hand book shop? That’s the reader. They can never resist smelling the pages, especially when they are yellow and worn. Click here to see Kerri & Jeff's engagement photos on Toronto Island!